Lots and lots and lots for you today….in the video plus scroll down for details! I’m hopping with Technique Tuesday today so be sure to get to that section and go see what everyone’s making! Just to prove that not everything has to be shaded to the “Nth” degree – there’s this card. 🙂 Plus some good news and bad news along the way. One additional piece of bad news is below that I ran out of time for in the video. Watch below or click HERE to see it in HD on YouTube. Good news for charities: Auctions! Puerto Rico auction raised $3603.57! I’m adding extra to make it an even $4,000 that will be sent to Puerto Rico for 1) installing solar panels in inaccessible areas and 2) roofing and training local roofers. THANK YOU to everyone who participated! Hurricane Florence auction of 55 Copic-colored cards is on NOW! Ends Sunday night Oct 7, 11:59pm Pacific. Bid high! The site is the same but different. Basic graphics will feel familiar. A few things have moved to different places on the new site. Coolest part? See the MY COURSES link in the menu bar – it’s so easy to find! Log in, pw changing, and other account things should be working so much better now! Classes you bought before SHOULD be in your “My Courses” link. If they are not, please email using the “support” link at the top of the page so I’ll know it’s on fire and I’ll take care of you asap. We spent tons of time on data transfers, but as you know, stuff happens on the interwebs! To celebrate the “soft” reopening….a GIVEAWAY – details are HERE! 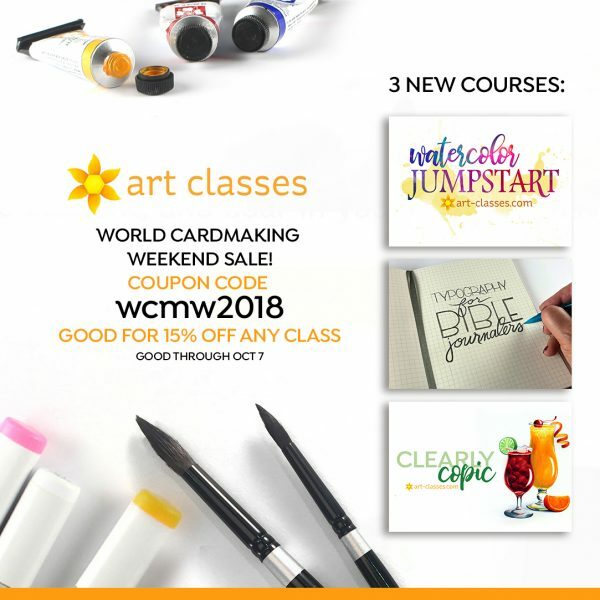 Coupon code for this weekend: wcmw2018 for 15% OFF! Copic prices are going up in January….bummer! But – we know now, so get your family to shop for Christmas gifts NOW! Markers will be out of stock as word gets out, so get your list together to share with Santa. Don’t forget to ask for refills! The Puerto Rico art trip for next year is cancelled. There was extremely little interest, even if all the “maybes” were yes, it would still only be 4 or 5 people in January or 4 or 5 people in April. I’ll be making a trip there myself, just not with a group. Back to good news: Promotions & Giveaways! PROMOTION: All weekend though Oct. 7th, you can get the You’re Owlsome stamp set for FREE through the Technique Tuesday website! 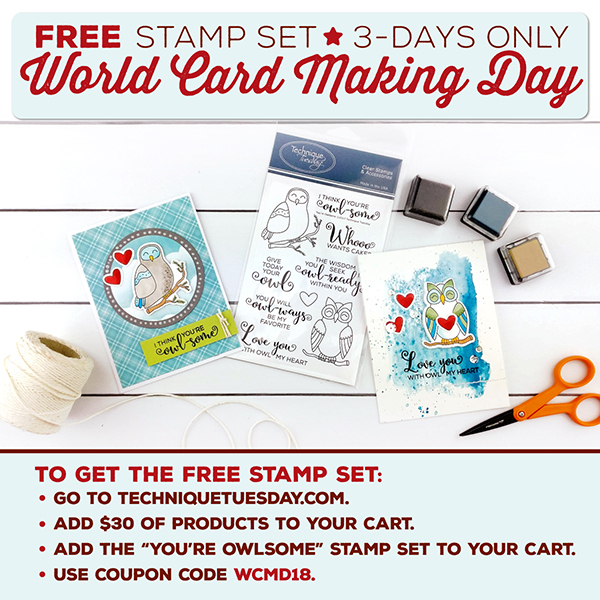 Just buy $30 in products on the Technique Tuesday website and add the Owlsome stamp set to your cart. 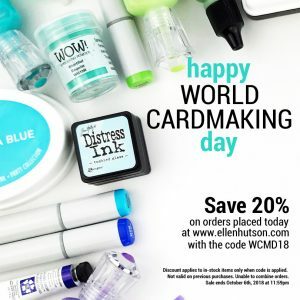 Enter coupon code WCMD18 at check-out and you’ll get the stamp set for free! TECHNIQUE TUESDAY PRIZE: Leave a comment on all the blogs as you hop to qualify for a Technique Tuesday gift certificate away to a commenter during the hop before Oct. 13th, 2018. The winner will be announced on the Technique Tuesday blog on Oct. 15, 2018! Good luck! ART-CLASSES PRIZE: Don’t forget to enter to win! More excellent news: A Bloghop! Beautiful card! I just love all the gorgeous vibrant colors! I also really love the hearts hanging from a string! and the look of snow everywhere too! So fantastic! Love the colors of your owl card! Where did you get your airbrush? And what type is it, please? Your owl card is awesome as always. Sorry about your trip, I wish I could have gone but we are on such a budget. I’m still trying to collect copies a little at a time. Your cards are always so fabulous! Plus, you do so much to help others. =)May God bless you for inspiring us to do more! Wow your card is so amazing. Amazing card with the owls! Gorgeous details and coloring! Hi Sandy, I’m glad you are part of the hop because it gave me a chance to sign up at your site. I started making cards this past year and all of the talented people out there sharing her/his work is helping me be brave and expand my horizons. Thank you. Adorable winter scene with those cute owls! Lovely card. Wish I could go to Puerto Rico with you. Hi Sandy, I see you have that the auction ends Sunday, Oct. 7th, at 11:59pm Pacific. However, when I clicked on a card to bid just now, the clock running down the time left indicates there is just under 4 hours left before the auction ends…? Am I reading something wrong? Thank you! Thanks so much, will have more time to look at this auction and your art classes tomorrow, yay! You are a blessing! Wow–owl-some card. Love the colors and great news about your auctions. I love how you have so much God within that works out. Thanks for all the good you do, and may all your goodnesses be blessed. out in the end. Love the card. the colors are deep and rich. Thank you for sharing you creativity. Your work is beautiful. Thanks for sharing another awesome video. Watching you color is mesmerizing, well done! I love how you do your backgrounds, now I know what to do with my copic airbrush, thank you . Cute card, thanks for the tip about the Copic Markers. Aww, Sandy! 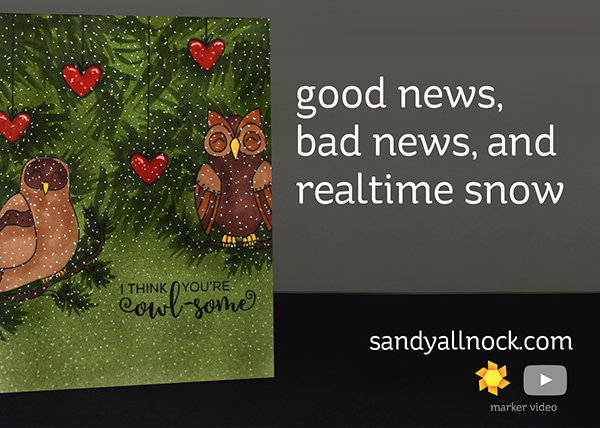 I love your card… and am so glad to get to hop with you. Sorry about your trip, but congrats on the site relaunch. Thank you again for taking part in the hop! Super cute! Thanks for the demo of the one layer Copic coloring and the info about price changing on the markers and refills! Thank you for all the news….. even bad news 🙁 Sorry about your trip! Thank you for the hop!